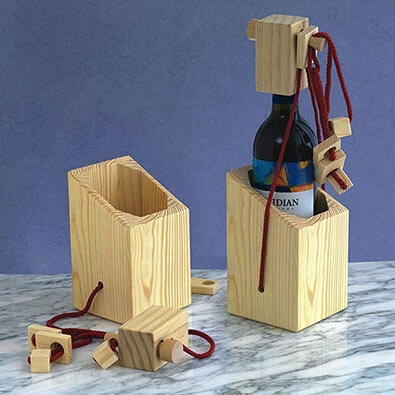 Bring a bottle of your favourite wine locked into our wooden puzzle and watch the fun begin! Watch your host's face turn from Chardonnay to Burgundy as they struggle to free the bottle! Includes four wooden and string puzzle pieces, assembly instructions and solution. A unique gift for any wine connoisseur. Measures 10cm x 10cm x 35cm when assembled on a bottle. Can you release the can from the locked cage? Place any canned soda or craft beer within the puzzle and let the fun begin. Challenge your friends to open it—it's not as easy as it looks! Made of monkeypod wood. 10cm x 13cm x 15cm. Solution included. Can you free the marble from the bottle prison? Once you know what has to be done, the trick is doing it! A real mind boggling gift for every puzzler. Measures 8 cm x 20 cm x 4 cm. Solution included.